Substance abuse is widespread in Australia. Almost one in seven Australians over the age of 14 have used an illicit substance in the past 12 months, and about the same number report drinking 11 or more standard alcoholic drinks in a single session. Substance dependence and behavioural addictions are chronic brain diseases, and people affected by them should be treated like any other patient with a serious illness, the AMA says. Releasing the AMA’s Harmful Substance Use, Dependence, and Behavioural Addiction (Addiction) 2017 Position Statement today, AMA President, Dr Michael Gannon, said that dependence and addiction often led to death or disability in patients, yet support and treatment services were severely under-resourced. “Substance use does not inevitably lead to dependence or addiction. A patient’s progression can be influenced by many factors – genetic and biological factors, the age at which the use first started, psychological history, family and peer dynamics, stress, and access to support. “The costs of untreated dependence and addictions are staggering. Alcohol-related harm alone is estimated to cost $36 billion a year. “Those affected by dependence and addictions are more likely to have physical and mental health concerns, and their finances, careers, education, and personal relationships can be severely disrupted. “Left unaddressed, the broader community impacts include reduced employment and productivity, increased health care costs, reliance on social welfare, increased criminal activity, and higher rates of incarceration. “About one in 10 people in our jails is there because of a drug-related crime. 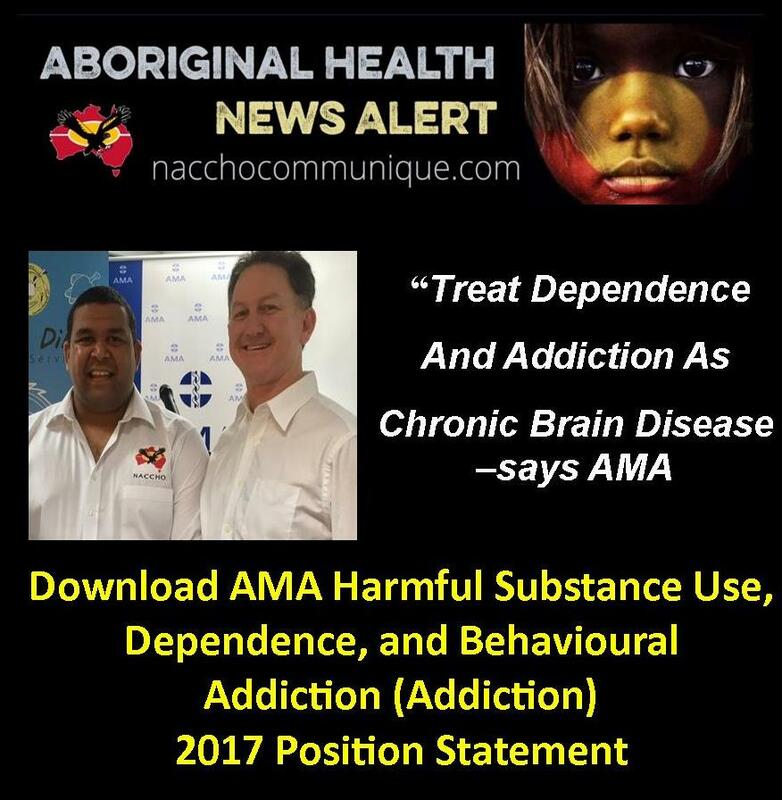 “Given the consequences of substance dependence and behavioural addictions, the AMA believes it is time for a mature and open discussion about policies and responses that reduce consumption, and that also prevent and reduce the harms associated with drug use and control. “Services for people with substance dependence and behavioural addiction are severely under-resourced. Being able to access treatment at the right time is vital, yet the demand for services outweighs availability in most instances. “Waiting for extended periods of time to access treatment can reduce an individual’s motivation to engage in treatment. “While the Government responded quickly to concerns about crystal methamphetamine use with the National Ice Action Strategy, broader drug policy appears to be a lower priority. “The recently-released National Drug Strategy 2017-2026 again lists methamphetamine as the highest priority substance for Australia, despite the Strategy noting that only 1.4 per cent of Australians over the age of 14 had ever tried the drug. “The Strategy also notes that alcohol is associated with 5,000 deaths and more than 150,000 hospitalisations each year, yet the Strategy puts it as a lower priority than ice. “The updated National Drug Strategy is disappointing. The fact that no additional funding has been allocated to the Strategy to date means that any measures that require funding support are unlikely to occur in the short to medium term. “The Government must focus on those dependencies and addictions that cause the greatest harm, including alcohol, regardless of whether some substances are more socially acceptable than others.